Supporters of the fascist English Defence League founder, Tommy Robinson, say they will march in Cambridge on Saturday July 21st . Using the smoke screen of ‘defending free speech’, they are trying to rebuild the far right, in the UK. A muslim female trade unionist driving a bus was also targeted by racist thugs; to her great credit, she refused to be intimidated. 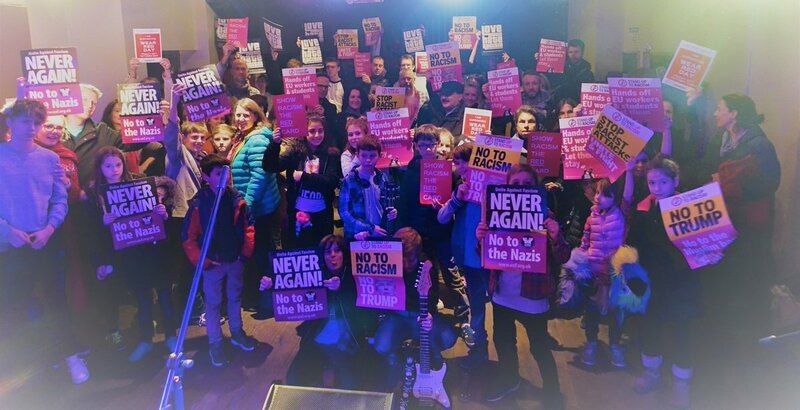 Despite the unprovoked attack unleashed on anti fascists, Saturday’s UAF/Stand Up To Racism march and the response to fascist violence has galvanised anti fascists. The Fire Brigades Union are helping to steward the Unite Against Fascism/Stand Up To Racism counter protest in Cambridge. The RMT union is laying on transport to the demonstration. Anti fascists are also coming from Norwich and Peterborough, in solidarity. Far right backers of Robinson are hardening up their supporters views. Open fascists on pro Robinson marches stand alongside figures from the European and American ‘alt right ‘ including noted Islamophobe Geert Wilders and Filip Dewinter, who has spoken with wartime Nazi collaborators in Belgium. They received a message of support from Steve Bannon, former chief strategist to Donald Trump. The Middle East Forum, a right wing U S body, is pouring all manner of resources into building support for the far right in the UK, with Robinson as the key figurehead. They claim they flew over a U S congressman, Paul Cosar, who spoke out for Robinson at last Saturday’s rally. Cosar, a notorious right wing figure has been heavily criticised in the U S for his remarks and actions, eg by the Arizona branch of the Council on American-Islamic Relations, the US’s largest Muslim civil rights group. Robinson’s case ( he was jailed for contempt of court over a highly sensitive trial in Leeds) saw him appeal at the Royal Courts of Justice in London, yesterday. Judges have delayed their decision against his conviction. The Court of Appeal expects a judgement on him to be made by the end of July. Cambridge UAF/Stand To Racism have issued a statement, part of which reads, ‘There is no place in Cambridge’s proudly diverse, multi cultural community for the sort of racism espoused by Robinson and his supporters. We stand proudly alongside our Muslim brothers and sisters. We won’t let the racists divide us, and call for the utmost unity against their poisonous aims. Stand Up to Racism and Unite Against Fascism are calling a counter protest on Saturday 21st July. We ask all who are angered by the rise in Islamophobia and concerned by the rise of the far right to join us on the day and to sign and circulate this unity statement by emailing standuptoracism.cambridge@gmail.com’. Weyman Bennett -joint Secretary of UAF said, ‘Last Saturday saw the hope expressed that we can beat back the fascists in a 3000 strong, anti fascist march in London. The nature of Robinson’s support is clear; it is violent, fascistic and islamophobic. Robinson is being promoted by wealthy figures here and abroad who want to foster race hate and division. We’re proud that trades unions like the RMT, PCS, Unite, the CWU, and PCS, among others, are mobilising for Cambridge. The conviction of nazi thugs like National Action this week and the core of Robinson’s backers must be opposed by all who wish to see the far right stopped’.